SHREVEPORT, LA — Joy Young, a touring spoken word artist and teacher based in Phoenix, Arizona, will perform in Centenary’s Anderson Auditorium on Wednesday, April 10, from 6:30 to 8:00 p.m. The event includes a poetry performance reading and audience Q&A, and is free and open to the public. Young produces poetry and workshops that have been featured by Button Poetry media and Everyday Feminism magazine as well as at colleges and in classrooms across the country. Producing work focusing on exploring social justice issues through poetic personal narratives, Young advances the idea that these narratives can be “…a doorway through which we should consciously enter the world of social justice” and serve as a driving force for personal and collective healing. Recently, Young has partnered with other organizations in Phoenix to create programming for the Re:Story Project, a pilot program seeking to implement restorative justice storytelling circles in high schools. Young’s visit is sponsored by Outreach, Centenary’s LGBTQ+ student organization. 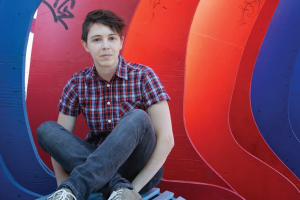 Ari Murphy, Outreach president, first discovered Young through some of their poetry focusing on the intersection between gender expression and sexuality. “We wanted to support smaller artists who are exploring their multifaceted identity and using their platform to promote justice and understanding,” says Murphy. For more information, contact Ari Murphy at amurphy2@my.centenary.edu.